For example, the line "went toward the bedroom door" may, to some people, bring to mind a door handle, walking and a bedroom, while another person may recall a television, home and their favourite TV series. The visual images may also be different. 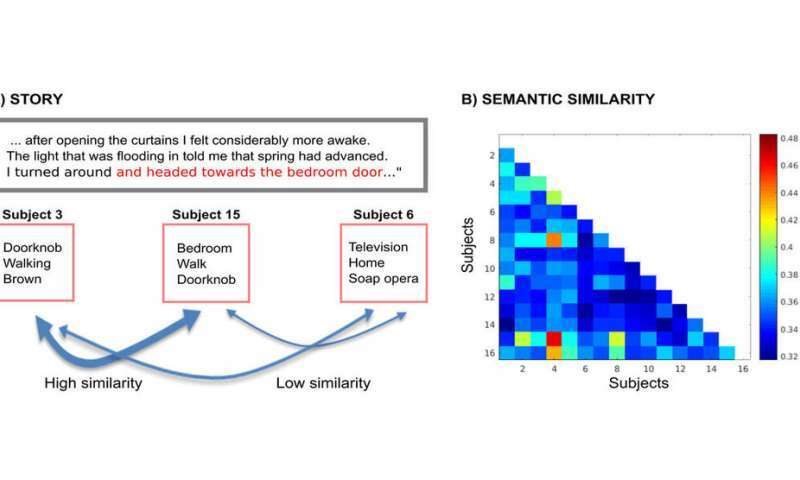 "Instead of focusing on individual statements, the study examined immersion, or similarity in brain activity, in relation to the entire story," Jääskeläinen says. Word lists produced by the research subjects were assessed using a semantic tree and latent semantic analysis. In a semantic tree, dots represent concepts and arcs portray the relationships between concepts. For example, the words "dog," "canine" and "spaniel" are close to each other in the tree, while "dog" and "submarine" are far apart. On the basis of this, estimations were made on how far the research subjects' word lists were from each other. "In the future, it will be interesting to see if this is caused by, for instance, cultural or personality differences," Iiro Jääskeläinen says.